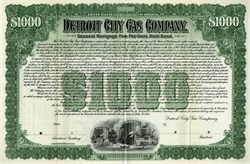 Beautifully engraved RARE Specimen Gold Bond Certificate from the Detroit City Gas Company printed in 1903. This historic document was printed by the Franklin Lee Banknote Company and has an ornate border around it with a vignette of the Company's facilities with a horse driven cart and trolley passing by in front. 40 coupons attached on left side. While the eastern part of the United States had enjoyed gas lighting since about 1820, the only source of light for the streets of Michigan was whale oil lamps. In 1848, civic-minded merchants and lawyers attempted to bring gas lighting to the area. In 1849, Lemuel Davis, a gas engineer from Philadelphia, took on the challenge of organizing a company and securing local financing. A new gas plant was built and Davis became president of the City of Detroit Gas Co., which was later renamed the Detroit Gas Light Co. It took Davis two years to build a system to "cook" coal and draw off the gas (a by-product of the process). Once this system was constructed, Davis faced the challenge of distributing the gas throughout the city. In June of 1851, 53 gas street lamps were erected on Woodward, Woodbridge, and Jefferson Avenues to light Detroit for the first time. Approximately three months later, light from 47 additional gas lamps reached neighboring streets. Over the next 40 years, gas usage flourished. Gas light was such a welcome improvement that the company strained production and storage facilities to keep up with demand. The Detroit Gas Light Co. built a second manufacturing plant near the future site of the Ambassador Bridge and extended its gas main to side streets. Meanwhile competition was increasing as the company watched a new adversary, the Mutual Gas Co., make its presence felt in Detroit. Eventually, Detroit Gas Light and Mutual Gas partitioned the city, with Detroit Gas Light serving customers west of Woodward and Mutual serving the east side. In 1889, a new competitor, the Michigan Gas Co., formed and built a 90-mile pipeline to convey natural gas from Findlay, Ohio to Detroit. Up until 1889 gas light was provided by manufactured gas. Rival electric companies were also competing fiercely for municipal street lighting contracts, and many homeowners had dual light capabilities. With great foresight, the gas companies began to explore ways gas could serve the public as a heating fuel. By 1890, gas-fueled stoves and furnaces were being purchased by increasing numbers of people. Intense competition among the city�s three gas companies threatened the survival of each, leading the companies to merge and form a new enterprise, the Detroit Gas Co. By 1892, the supply of natural gas began to dwindle, and the Detroit Gas Co. turned once again to manufactured gas. After 1900, the cost of equipping a five-room house with piping and fixtures for gas lighting was about $9. About this time, the Detroit Gas Co. began vigorous promotional efforts around the gas stove. The great anthracite coal strike of 1902 played a role in changing skepticism about cooking with gas, and the gas range became a fixture in virtually every middle-class home in Detroit. In 1903, the Detroit Gas Co. was re-named the Detroit City Gas Co.. It secured franchises for Highland Park and Hamtramck, and increased its customer base to more than 67,000. In 1905, a majority of the Detroit City Gas Co. was acquired by the American Light & Traction Co., a holding company that controlled utility and transportation interests stretching from Grand Rapids to Milwaukee. The organizational structure suited both American Light and Detroit City Gas very well. American Light provided half the coal Detroit City Gas needed for its manufacturing operations. In 1913, Detroit City Gas acquired additional service territory that included the communities of River Rouge, Wyandotte, Dearborn, Ecorse and Trenton. With increased service territory came new plants and hundreds of miles of gas mains to keep up with local expansion. In 1936, natural gas was reintroduced widely to the residents of Detroit. Making the supply possible was the 1,200-mile Panhandle Pipeline which stretched from Texas to Michigan. A contract between Detroit City Gas and Panhandle allowed a maximum daily delivery of 90 million cubic feet of natural gas. A small army of 2,500 appliance adjusters, trained by the company, visited more than 500,000 customers to perform necessary adjustments to gas-burning equipment. The so called "big switch" was completed safely and without incident. In 1937, a plan was developed to merge the Detroit City Gas Co., the Grand Rapids Gas Light Co., the Washtenaw Gas Co. and the Ann Arbor Gas Co. The merger was approved by the Securities and Exchange Commission and the Michigan Public Service Commission, and in 1938 the new utility became known as Michigan Consolidated Gas Co. (MichCon). The natural gas market was expanding and so was the use of gas in manufacturing. Through the years, MichCon had slowly accumulated a number of industrial customers. But the great quantity and inexpensive price of natural gas opened a whole new field of possibilities. Soon, the original allotment of 90 million cubic feet of gas per day was not enough to meet the increased demand. In 1940, the contract between MichCon and Panhandle was renegotiated to allow as much as 125 million cubic feet. But even before Detroit had swung into wartime production the 125 million cubic feet was not enough. Another problem facing Detroit was the enormous disparity between the amount of gas consumed in the summer and in the winter. On an average January day, the consumption of gas was likely to be eight or nine times that of any 24-hour period in August. On the coldest days of winter, the amount of gas consumed by the customers in Detroit might be 25 percent higher than the maximum allowed under the Panhandle contract. To address this problem, MichCon turned a depleted underground gas field into Michigan's first natural gas storage facility. This allowed MichCon to purchase gas at lower prices during the summer and store it for winter usage � a strategy that is still used today. To meet the increasing demand for natural gas, the Michigan-Wisconsin Pipeline was completed in 1945. MichCon (and its affiliated companies) shattered all precedents by going into the pipeline business themselves. In 1949, Michigan Consolidated Gas, the Milwaukee Gas Co., the Michigan-Wisconsin Gas Co., the Austin Field Pipeline Co. and the Milwaukee Solvay Co. became the American Natural Gas Co.